Increased payout in December following 3-for-1 stock split. Cigarette maker Lorillard (UNKNOWN:LO.DL)announced yesterday its second-quarter dividend of $0.55 per share, the same rate it paid last quarter after it increased it 6% from $0.517 per share on a split-adjusted basis. The board of directors said the quarterly dividend is payable on June 10 to the holders of record at the close of business on May 31. 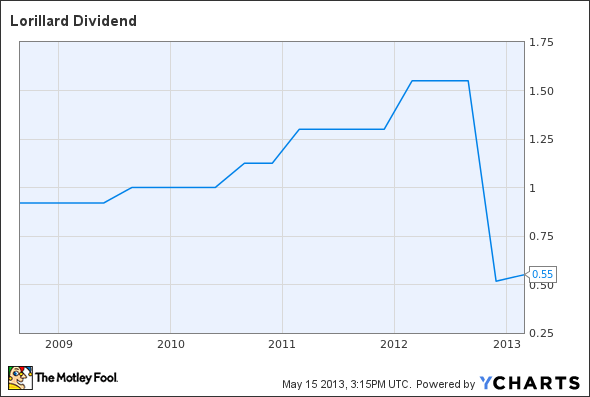 Lorillard has paid a dividend quarterly since 2008. The regular dividend payment equates to a $2.20-per-share annual dividend yielding 5.1% based on the closing price of Lorillard's stock on May 14. LO Dividend data by YCharts. Chart does not reflect 3:1 stock split effected Dec. 14, 2012.